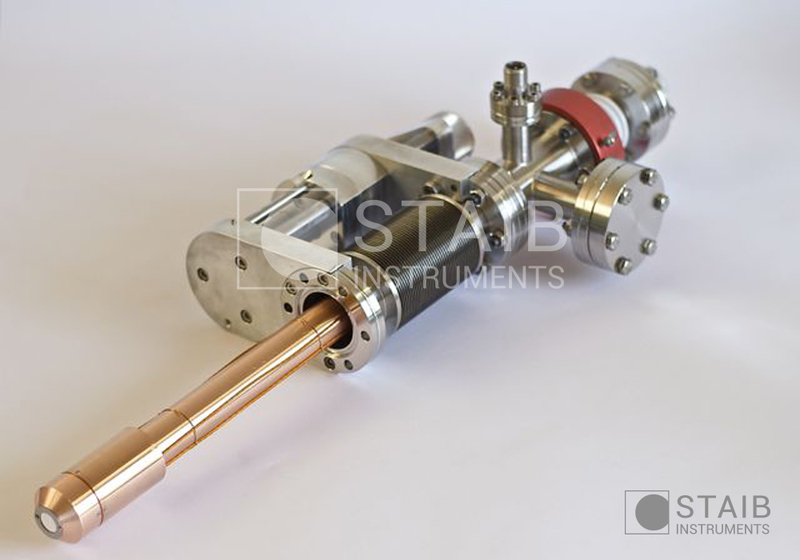 The STAIB Instruments RQ-300 X-ray source is a precision instrument designed specifically for X-ray Photoelectron Spectroscopy (XPS). The source is equipped with a twin anode: Aluminum (Al), producing X-rays in the 1486.6 eV line; and Magnesium (Mg), producing X-rays in the 1253.5 eV line. The system is water-cooled, and can be operated at powers up to 300 W (Mg/Al). The source is fully UHV compatible, and can be operated at pressures as high as 10-6 mbar, but a maximum pressure of 10-8 mbar is recommended. A differential pumping option is available if higher pressures are required. When all of the cables and the safety hood have been removed, the source can be baked to 250 °C. Additionally, the source will generate bremsstrahlung,which will not pass through 1.5 mm thick stainless steel. A local dose of 0.1: Sv/h will not be exceeded more than 10 cm from the source. All viewports on the vacuum chamber must be fitted with leaded glass or protective metal caps, which must be in place while the system is operating. The system must only be operated by qualified personnel, following standard safety procedures as well as any specific safety procedures that may apply to the user’s location and situation. The RQ-300 electrical system is fitted with three safety interlocks. They verify correct levels of water flow and vacuum pressure, and that the high voltage safety cover is in place. All three interlocks must be satisfied for the system to operate. There is an interlock controller between the two power supplies that shuts off the functionality of both, should any of the three interlocks trip.